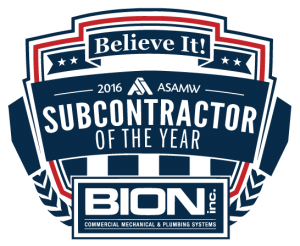 Unlike other mechanical contractors, BION specializes in the field of healthcare. Our highly-skilled employees have extensive experience and a proven reputation of excellence in delivering quality solutions to address the unique needs of the healthcare industry. Our expertise includes commercial HVAC, plumbing and medical gas installations, renovations and service projects. At BION, we work closely with owners, engineers, and end users to provide state of the art services and solutions with the patient being our first priority. The BION healthcare specialization has been cultivated through years of experience and dedication by the owners and employees of our firm. We are able to provide such specialization because of the broad experience, yet focused expertise of the people of BION. Our management team has nearly 200 years of combined experience in the commercial mechanical business, more than 100 of which are in the healthcare industry. Our field employees’ collective tenure exceeds that of management’s. Everyone at BION is dedicated to our clients and our profession. This is evident each and every day by the proven individual and group efforts that demonstrate our high quality of work, excellent safety standards, and continued education. Our capabilities range from emergency service repairs to multi-million dollar projects for all aspects of healthcare and mechanical systems. These include new construction, renovations, additions, and plant upgrades. Click here to partner with BION on your project.